There are 7 core areas of life that if they are running well, a woman gains forward movement in her life. Picture life like the spokes of a bike wheel, if each spoke is strong, the cyclist is able to keep moving, travel to beautiful places, peddle towards hopes, dreams, goals and ARRIVE at her God-given destination! Hurrah! Celebrate SUCCESS! However, if any spoke breaks, the wheel goes flat and you become STUCK in life. Let this be the summer of success! Join me for "7 SIMPLE SKILLS FOR SUCCESS STUDY"
Option 1: A FACEBOOK LIVE: Each Wednesday evening at 6:06 pm PT, I will host a Facebook Live teaching session in a PRIVATE facebook group ( Session will run 25- 40 minutes). 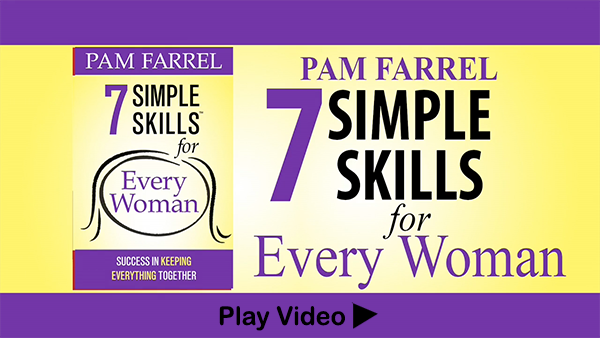 We will work through the7 Simple Skills for Every Woman: Success at Keeping It All Together book TOGETHER. You will be able to interact through the comments on the private facebook page. The chapters are an easy read, and the interactive activities are fun and will help you personalize the material to bless and build YOUR life! Option 2: Personal "Zoom" Live Video "FACE TO FACE" Success Class. Only 9 women will be in this online face to face book study and coaching session. ( Zoom class will last approximately 55 minutes) We will journey through the material together-- AND Pam will help you EACH APPLY these concepts to your life (your relationships, your work, your ministry) to help you gain forward movement in your life and on your goals so you can SEE the SUCCESS you have been longing for! Option 3: PRIVATE coaching session with Pam. You may want more 1 to 1 time with Pam to help you gain forward movement in your writing project, speaking ministry, getting your business up and running; or you may be looking for wisdom in your dating or marriage relationship, or to get specific assistance with one of your children/ teen or young adult; or you may need some insights for your relationship with your parents. $100 per 30 – 40 minute session. Sign up for ONE coaching session Sign up here. These coaching sessions will be arranged to fit in your schedule. SPACES are VERY LIMITED in Pam's schedule, so if you want PRIVATE coaching this summer with Pam, register EARLY to secure a spot. Once you register, Pam will contact you to schedule your first session. For discounts on these, or any Love-Wise resource or Love-Wise sponsored event or study, go to the membership page and subscribe. There are three levels of membership-- each gaining more access to the Farrel's' wisdom and insights and more material to help you live Love-Wise.